Grease a small baking tin and line with baking paper (I use a loaf tin). Melt the butter or coconut oil in the microwave and roughly chop the pistachios and cranberries. Set aside. Break the chocolate into pieces and pop them into a microwave safe jug or bowl. Put the jug in the microwave and cook on high for 1 minute. When done, give the chocolate a stir and then keep microwaving in 10-20 second bursts until the chocolate is fully melted. It takes a total of 1 minute and 30 seconds in my microwave. If you don’t have a microwave, don’t worry. You can melt the chocolate using a double boiler on the stove. Mix the butter/coconut oil, almond butter, and half of the pistachios and dried cranberries into the chocolate (don't forget to reserve some cranberries and pistachios to sprinkle on top) until the mixture is smooth. If your almond butter is on the dry side, you might need to smoosh it into the mixture with the back of a spoon. 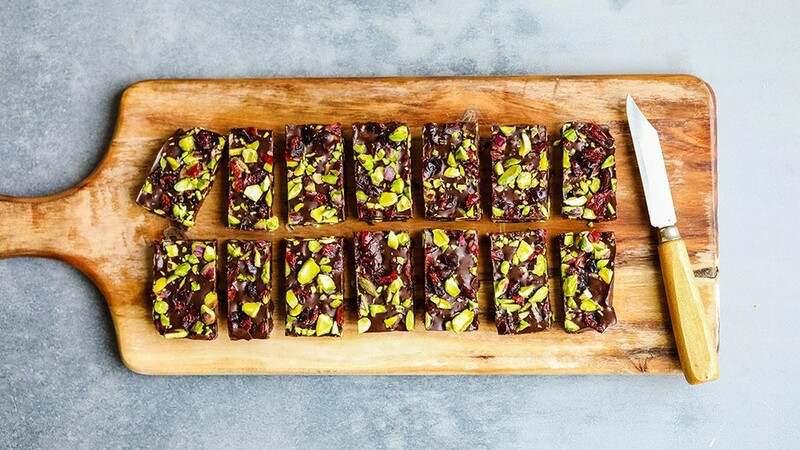 Pour the chocolate mixture into the lined tin and sprinkle the remaining pistachios and cranberries on top. Refrigerate for at least 1.5 hours or until set. If you’re in a hurry, pop it in the freezer so it sets more quickly. Once set, cut the fudge into 16 pieces. Store it in the fridge until it’s ready to be eaten.